Wearing a slightly mischievous smile, 70-year-old Ralf Hotchkiss waits until I get my camera focused on him before he plows his wheelchair through some branches drooping from a small tree near the creek that runs through the UC Berkeley campus. He proceeds to mow over a plant, then positions his chair on a stone ledge a few inches from the ground—balancing on the rear wheels with his knees pointed towards the sky—before dropping down to the asphalt walkway. Using techniques borrowed from mountain bike riders, the engineer, activist, and co-founder of the Berkeley-based nonprofit Whirlwind Wheelchair is demonstrating how standard wheelchairs—typically doomed to destruction when ridden anywhere without a smooth surface—can be taken off road to withstand real-world abuse with some crucial, low-cost modifications. “My first chair lasted half a block. I hit a crack in the sidewalk, smashed one of the front wheels, and had to be dragged back to the hospital,” said Hotchkiss, who would later win the Genius Award from the MacArthur Foundation for his international contributions to independent living. “From that point on I was repairing, reinforcing, and reengineering chairs” so they would, at minimum, match the standards of bicycles built in the 1890s, he added. That was 1966. Hotchkiss was 18 and had become a paraplegic after crashing his friend’s new motorcycle while coming around a corner too fast. The founding of Whirlwind Wheelchair in 1979 marked the start of what would become his life’s mission: to provide real mobility to the 50 million people worldwide that he estimates require sturdy and safe wheelchairs. 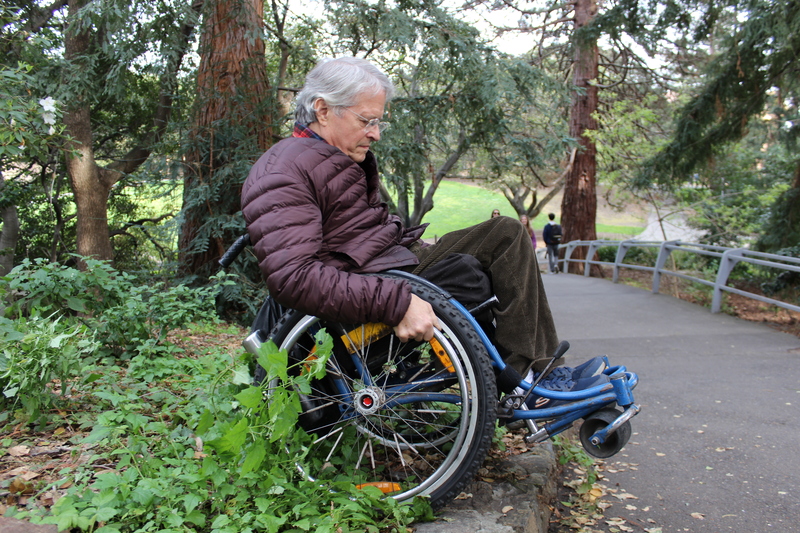 “We’ve hardly started,” said Hotchkiss, who from 1989–2014 taught a course on wheelchair design and construction at San Francisco State University. He puts the number of wheelchairs Whirlwind and its network of workshops has built over the past four decades at around 100,000. The Whirlwind project began after Hotchkiss traveled to Nicaragua in late 1979. There, he met four boys who reinforced a single wheelchair they shared between them so it wouldn’t crumble on roads made from large, round cobblestones that villagers used for barricades against government tanks during the country’s revolution. Since then he’s traveled to more than 40 countries throughout Asia, Latin America, east Africa, the Near East, and Siberia, linking together a network of workshops that modify and reinforce hand-me-down and throw-away wheelchairs from the US and Europe so they can be used on farms and over rough terrain. It didn’t take long for Hotchkiss to realize that the standard wheelchair wasn’t much safer than the jerky-throttled two-stroke motorcycle that led to his accident. For decades he would get tossed to the pavement once or twice a year whenever his wheelchair got stuck in a sidewalk crack. In the early 2000s he sliced off one of his toes which had been dangling off the edge of his chair’s footrest when it came up against a door frame. And then there’s the problem of the rear brake mechanisms situated too close to the tires--and thus the rider’s fingers. The safety hazards and lack of development of wheelchairs was partly due to a monopoly on wheelchair production and sales in the US by Everest & Jennings. The monopoly was broken when the company agreed to a 1979 settlement following an antitrust lawsuit filed by the US Justice Department. The nature of those poorly-designed and constructed chairs, combined with the lack of replacement parts in poorer countries, resulted in an activation of local ingenuity around the world to rebuild wheelchairs to meet the conditions of the terrain in their own countries. “When your chair breaks down, there’s nothing you can do. You can’t get a replacement from the people who came once and gave away 1,000 chairs and disappeared for five years,” Hotchkiss says. Some of the key features of his current chair are the 24-inch mountain bike tires in the rear with the top of the wheels angled inwards for a more ergonomic function, a German-inspired rear brake, and an extended front wheelbase to prevent tipping over forward, which he explains is the primary cause of injuries among wheelchair riders, often leading to broken femurs or fractured skulls. His front wheels, made of thick rubber in their centers, but hollowed out at their ends, were taken from Zimbabwean push carts designed to roll smoothly on solid ground while not getting dug in sand—a marvelous design he’s trying to pass on to other parts of the world. “We’ve done our best to spread the Zimbabwe technology, and they’re in a dozen countries now,” he added. In addition to the wheelchair monopoly, Hotchkiss also attributes the safety hazards and poor reliability of standard wheelchairs to society’s “custom of pity” that keeps people with disabilities excluded from participating in society in a meaningful way. Simply offering help or care is not enough, Ralf argues. It’s more important to understand the needs of wheelchair riders so chairs can be built to “liberate” them, as opposed to leaving them feeling bound. “People are just kind of given a wheelchair and forgotten about…or [they’re] allowed to have a little bit of mobility, but are not encouraged to go out, go to school, get a job, fight for political office, demonstrate, all those things,” Hotchkiss said. But the innovators around the world working to fill the gap for wheelchair riders—left by an industry which doesn’t regard them as whole persons—operate with a different mentality. For Hotchkiss, the end goal is to perfect a wheelchair design which can be built and maintained in any corner of the world using locally sourced materials and which are cheap enough to compete with imported chairs. Upfront costs of the chairs are less important than long term maintenance, he explains, so they can be performed by local blacksmiths and mechanics.